Many Voices, One Nation takes visitors on a chronological and thematic journey that maps the cultural geography of the unique and complex stories that animate the Latin emblem on the country’s Great Seal and the national ideal: E pluribus unum, Out of many, one. 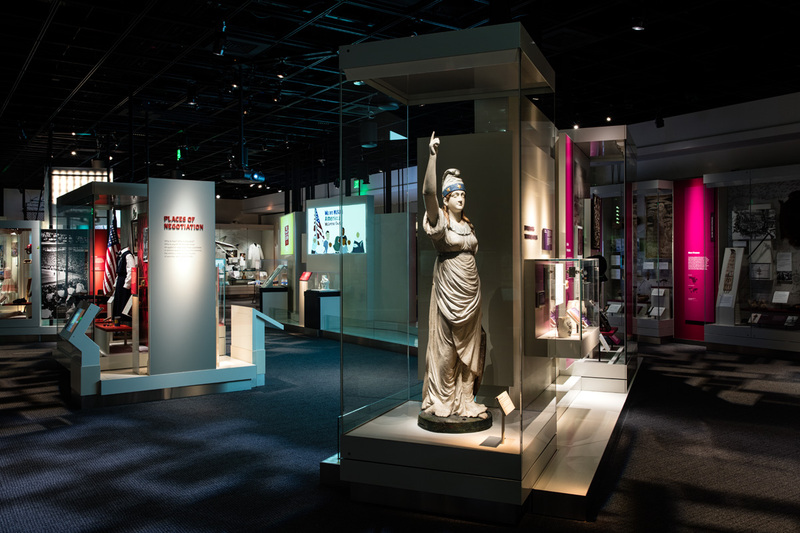 Through almost 200 museum artifacts and about 100 loan objects, this exhibition shows how the many voices of the American people have contributed to and continue to shape the nation and its communities, from its earliest beginnings to the present. Through objects such as a painted elk hide from the Southwest, circa 1693, a Norwegian bowl brought by 19th-century immigrants, a gold miner’s trunk, symbols of union and liberty such as Uncle Sam and Columbia, and a baseball helmet used by Boston Red Sox player Carl Yastrzemski in the 1970s, the exhibition explores the never-ending process of becoming one nation.